Started in 2014 with Math building G5 Construction continued through several phases including G5 site concrete paving, building G8 and finally the remaining site work which was completed in 2017. This GC delivery project was courtesy of Harper Construction and the Los Angeles Community College District. Started in 2013 in the center of the COC campus, the ICUE building and site work were successfully completed, on time, in 2015. This project was a multi-prime delivery from the College of the Canyons school district with Lundgren Management as the construction manager. 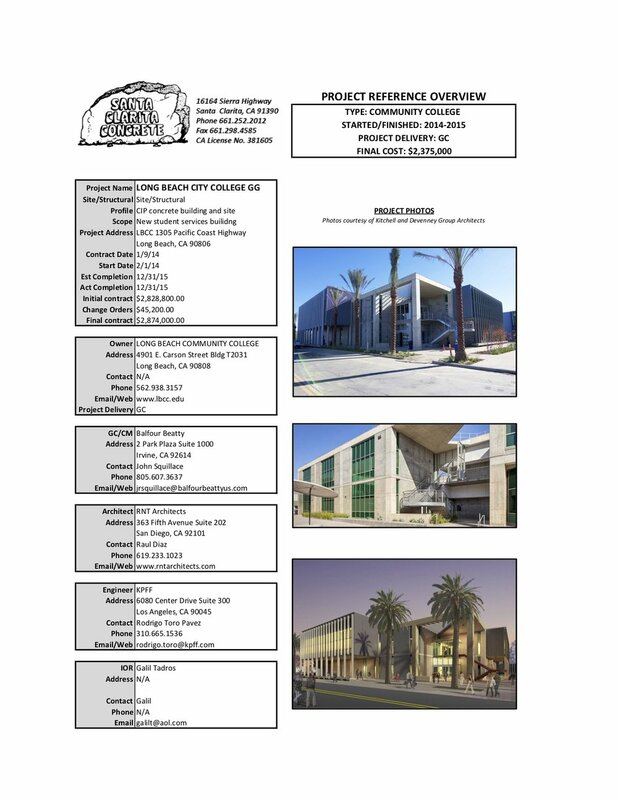 This GC delivery project was contracted by Balfour Beatty and began in 2014 for the Long Beach Community College District. Structural and site work completed on time in 2015. Project highlights include cast in place concrete foundations, slabs, walls, columns and roof all with intricate rustication patterns and specialty white concrete.